Saturday: I have the pleasure of a long weekend and my first day off work since New Year. I’ve built myself up for it by ignoring the ironing pile and going out with my neighbours for a few beers. They’re getting married next weekend and I’m missing my team in the FA Cup semi final to go to the wedding. This ensures I sleep through to around 5 am, which on the eve of an event is tremendous progress. It’s a glorious drive down, apart from making myself drive through London to remember why I would never live there. Martin is already at the course in Sidcup and the first thing I have to do is remove clothing, it’s warm for March. I get to play minigolf for a number of hours in the sunshine without looking like I’m wearing everything I’ve packed for the weekend. With the any ball rule in place rather than the single ball event for the Kent Open, played in November, I look to using a limited selection but something with a weight I’m more comfortable with. Sidcup doesn’t require many rebounds shots, although it is possible to play the entire course without one, I practice a couple of alternates to what I would normally do with the heavier ball. The lack of wind today and probably tomorrow too is a complete contrast to three weeks earlier at Hastings. It’s so pleasant, I begrudge taking a break for food but apparently, you need that to get through life. By mid-afternoon, roughly half of the field had turned up for practice and although with the conditions perfect, it wasn’t too crowded with the public around. I try for some scored rounds today and they’re solid. 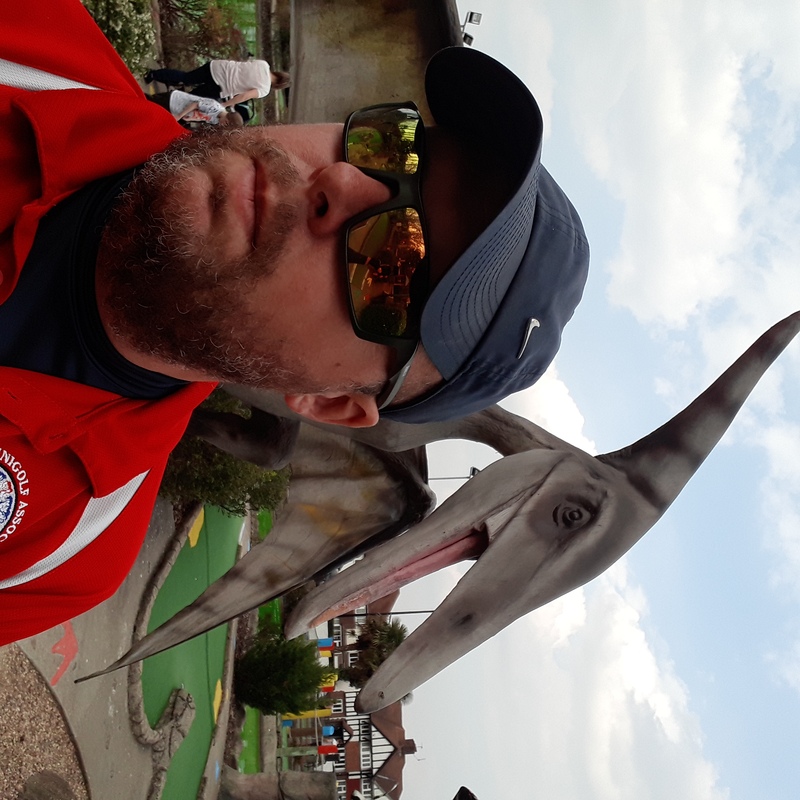 Sidcup rewards those who don’t drop shots rather than make aces so playing seven rounds with only three scores of three makes for a happy Stevie. Having played for around eight hours, I start to tire and call it a day. I get invited for a few beers by Andrew, Andy and Simon but I prefer to check in to the hotel with Derek and his son, Anton. I’ve changed. I’m in the seniors category from 2020 and my demeanour tonight suggests I’m ready for it now. We look for a child friendly pub and track down the Horse and Groom, which gives me another chance to show my skills at stacking the salad bowl to beyond the dish is capable of handling. I’m sure the Harvester chain no longer does sticks of celery for this precise reason. During the meal, the length of the day hits me and I say to Derek that it wouldn’t be the worst thing if I had an early night for once. A weekend away from home and I’m going to be in bed by 9 pm. On the way back to the room, we spot the ones who popped off for a few beers earlier still going. Sunday: British summer time has begun with overnight rainfall that hadn’t been forecast, I open the curtains and sigh. We’ve lost an hour of sleep and with the water retention level at Sidcup being higher than most, my first job of the day is attempting to clear the greens of flooding by using a plastic clipboard. As we all know, a damp track is going to lead to all kinds of changes in pace. Although the course will dry out during the day, the first couple of rounds will be affected. News started circulating that the British number one, Michael Smith, wouldn’t be playing. An already open competition has just been blown wide apart. The defending champion, Andy, had a late night and right now, as many as twelve people would be in with a good chance. It’s rare that this ever happens and it’s exciting for sure. I’ve tried my best to relieve the water situation. A few holes are still a problem but by tee off, it would at least be manageable. I decide to stick with my original game plan on choice of shots and mentally manage the felt in my head. My partner for the first three rounds is Dave Donnelly, who has a good track record here. I won’t lie, this was always going to be one of the toughest days I’ve ever faced. It’s the first Mother’s Day without my mum, one of those situations that you’re never entirely sure how you will be until it happens. I did my best to concentrate but mum was always on my mind. The tannoy at the course even played Labi Siffre’s “Something Inside So Strong”, which I last heard at her funeral. I took it that it could be a sign, although I did cry a little hearing it again. We both make a good start, both getting under par by our sixth hole. It’s quiet out there and from the view I had, not many were making progress. With my second ace of the round at the 15th, I take the lead at two under and by the end of the round, myself and Dave are the only ones to be level par or better. As expected, it’s close. Another eleven players are within five of the me. I had been the only one to have a clean round in the opening lap but my first tee shot of round two, I overhit by around a couple of putter widths and snooker myself. I spend most of the next half an hour trying to get parity, eventually achieving it with three holes remaining. Dave hasn’t faired as well, I reassure him that he is putting well. A number of his shots were resting within a foot of the hole. I’m pleased with the quality of my second putts and though there aren’t many I have to reach for my notebook, everything is hitting the back of the cup. I’m now two clear of Martin Greenhead and Andy Exall. I’m daring to dream, it’s been over two years since my only tour victory. With the thought of a platter of fish fingers sandwiches for lunch on the cards, the third round begins. Dave drops a shot on 18 as his ball gathers a large amount of Cherry Blossom on the way down the hill. I lose a shot at the third, just brushing the wall on the left and leaving a fifteen-foot putt over the rug. A centimetre to the right with the tee off and it would have been next to the hole at worst. I rescue it at the fifth. Dave recovers well with a 35 and a second straight par round maintains my two-shot advantage as we go into the final round. This time, I’m clear of Martin Greenhead and Mark Wood, which was the final group when we competed for the Category 3 title at the Kent Open back in 2013. I collect my order of food. As the groups go out ahead of us, I start to entertain thoughts of winning the tweed jacket and the dry-cleaning costs that come with it. What I know is that if I keep to my plan, looking at a par round, someone will have to hit 33 to win it and they would deserve it. The first four holes produce pars for all of us, I became aware that Will was making a move early. Martin aced the fifth. Mark and I get the seventh. All three of us got the ninth. You could tell the pressure was mounting but we were producing some quality shooting. Mark dropped one at the tenth and I thought his chance had gone. The twelfth gave up another hole in one bonanza and whatever the guys were throwing at me, I was finding an answer. Mark nailed the pipe hole and I struck my first tense putt of the day, missing right for a three. Martin incredibly hit an ace up the hill at the 14th to take the lead. My luck with running out as the wall pushed my ball around six foot away. Again, I missed right for a three. The drama came at the penultimate hole, the volcano. It’s daunting at the best of times but right now, it looked like the North face of the Eiger. There are two tactics here. Go for the ace but you’re likely to take three if you miss. Go for the lay-up. We all go for the spot at the foot of the hill. Mark is first up and I can sense his nerves. Much like when he won the Cambridgeshire and Essex Open in 2017, when I kept eating into his seven-shot lead. After taking time to compose himself, he jabs the ball into the hole. Martin, who had never won a tour event, spent a few minutes wandering about the previous holes. The putt from the spot is less than two feet onto an upturned bowl. If you miss, there is no safety. Martin, his heart probably racing like a mouse, missed for par and takes a four. It’s a heartbreaker and hard to watch, having played so well. It’s my turn now and I just want to get it over with. I walk away after my tee shot, it’s about right. I tell myself ‘you’ve made this all weekend, just once more’. Whatever happened next, I feel I rush the situation. It reaches the right edge of the cup and drifts away. It’s a horror moment. I take a four. Mark now leads by one coming down the last. His two from off the mat rules me out and Martin needs an ace to tie. Martin gives it every chance but doesn’t get the desired result. Of the three of us, I come closest to the hole in one but I’m despondent. I’ve probably only hit three bad putts all day and its cost me. That’s how fine the margins are at Sidcup. It is a special course for a tournament, if you’re into that kind of thing. I end up in fourth after losing a playoff at the first extra hole but by that time, I’ve lost interest. After the presentations and loading up the car, I sit alone for around twenty minutes. The emotions of Mother’s Day finally catch up with me. I’d led the event for 67 holes but couldn’t finish off the job. This one hurt as I felt fully in control and only a couple of moments cost me. Mum always told me ‘as long as you had fun, that’s all that matters.’ Mum was right, of course, but today of all days, would have been the perfect way to mark the occasion. I tried my best. I have two months off. The views expressed in this blog are solely the views of the writer and do not represent the World Minigolf Sport Federation (WMF), Minigolfnews.com or any other organization that the writer may be associated with unless expressly stated in the blog.